The measurements we make on the ship only give us a snapshot to aid our understanding of Atlantic Ocean dynamics. The Royal Research Ship James Clark Ross receives satellite images from the Copernicus programme each day. 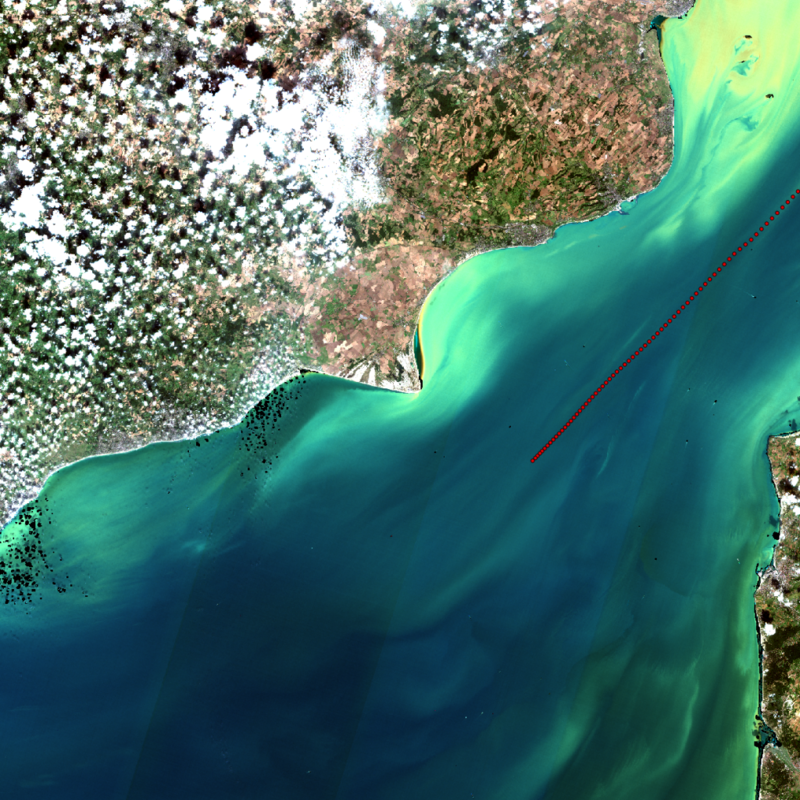 The objective of the AMT4SentinelFRM cruise is to validate ocean data from the fleet of Europe’s Sentinel-1, -2 and -3 satellites as they orbit above the Atlantic Ocean. These satellites, which were developed by ESA for the EC’s environmental monitoring programme, carry a range of sensors for observing land, ocean and atmosphere. High above our heads, in the space, NASA and Copernicus satellites carry sensors that scan Earth –continually measuring the surface properties of the ocean. The main data we receive are measurements of sea-surface temperature and ocean colour. Sea-surface temperature is detected by the Sea and Land Surface Temperature Radiometer (SLSTR) carried on the Copernicus Sentinel-3A satellite. Ocean colour is literally ‘the colour of the ocean’ derived from satellite instruments that measure the reflection of light from the top five metres of the ocean and convert it into Chlorophyll-a (Chl-a) concentration, the photosynthetic active pigment of phytoplankton (marine algae). These data are processed and can then be mapped into images at 9, 4, 1 km or 500 and 300 metre resolution. 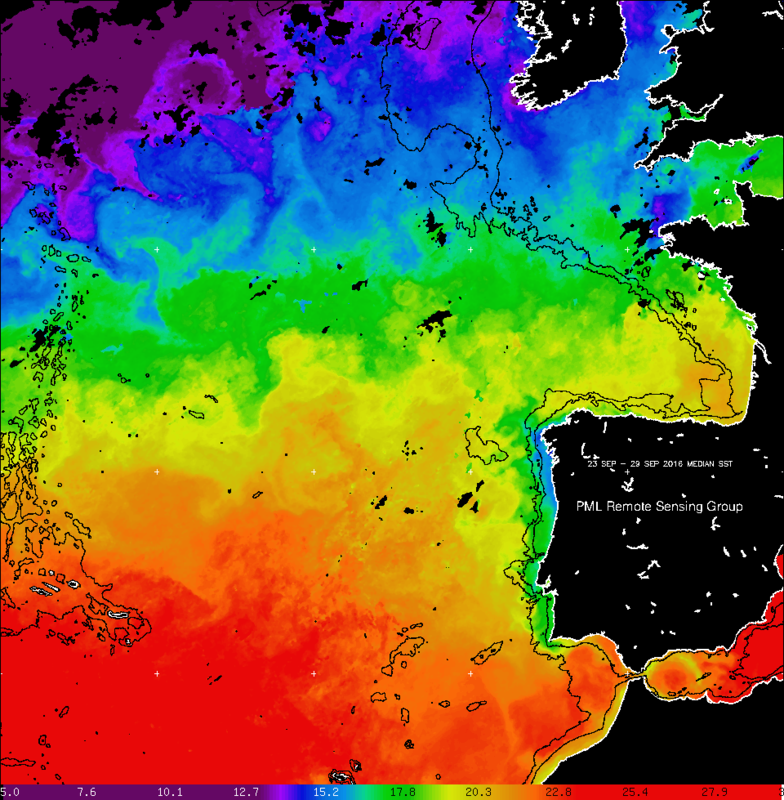 Sea-surface temperature composite on 23–29 September 2016. During AMT26, we have received some spectacular satellite imagery from Copernicus and NASA, which has been processed by the National Earth Observation Data Analysis Archive Service at Plymouth Marine Laboratory. As the ship sailed through the English Channel, this Sentinel-2 image provided a bird’s eye view of both the terrestrial vegetation of southeast England and the highly variable conditions in these coastal waters. 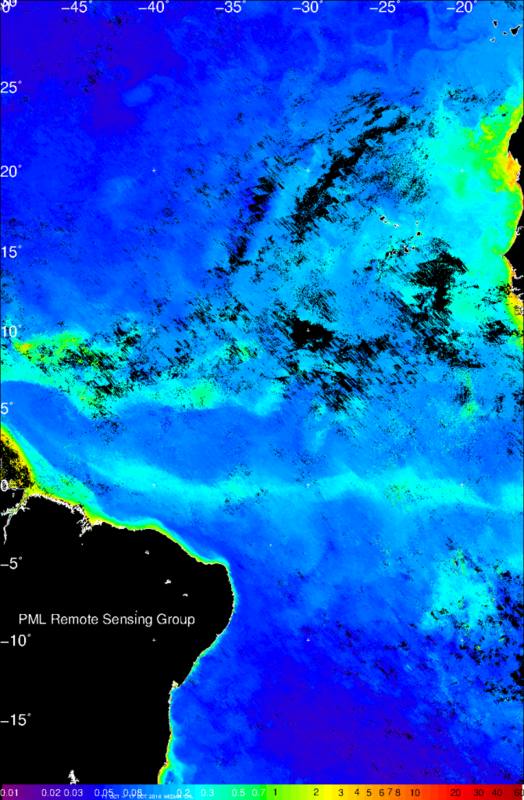 The bright green and yellow filaments in this image are autumn phytoplankton blooms and the darker brown patches close to the coast are of suspended particulate material. Further off-shore you can see the deeper blue waters of the Channel (first at top). Chlorophyll-a median composite on 23–29 September 2016. 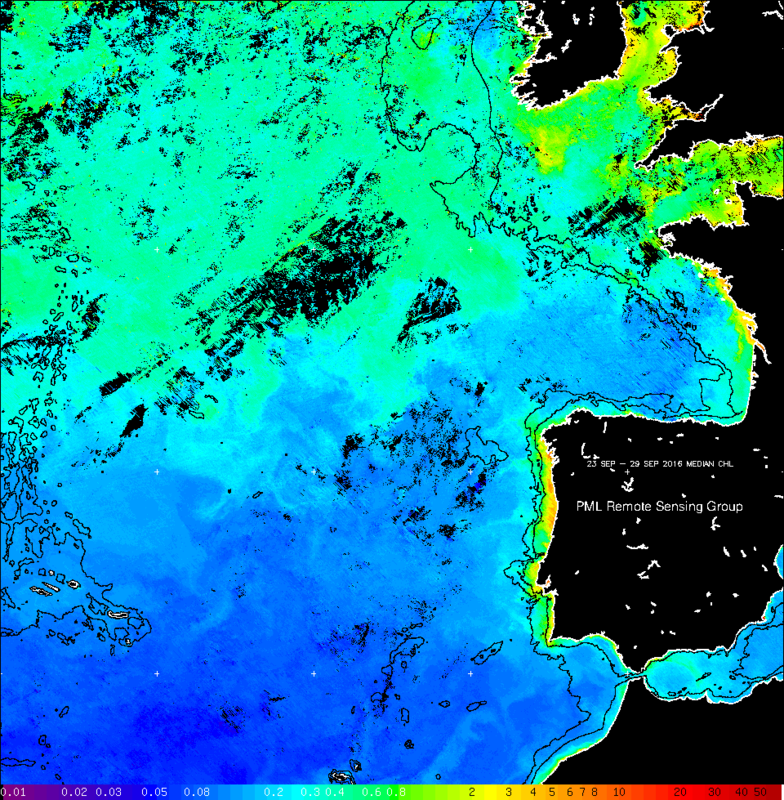 As the ship traversed further south, the Chl-a images show the transition from colder water (<17°C) with relatively high Chl-a (>1 mg m-3) in the North Atlantic to the warmer (>20°C) sub-tropical Atlantic water off the north coast of Africa with lower Chl-a (<0.08 mg m-3). Sea-surface temperature composite on 11–17 October 2016. 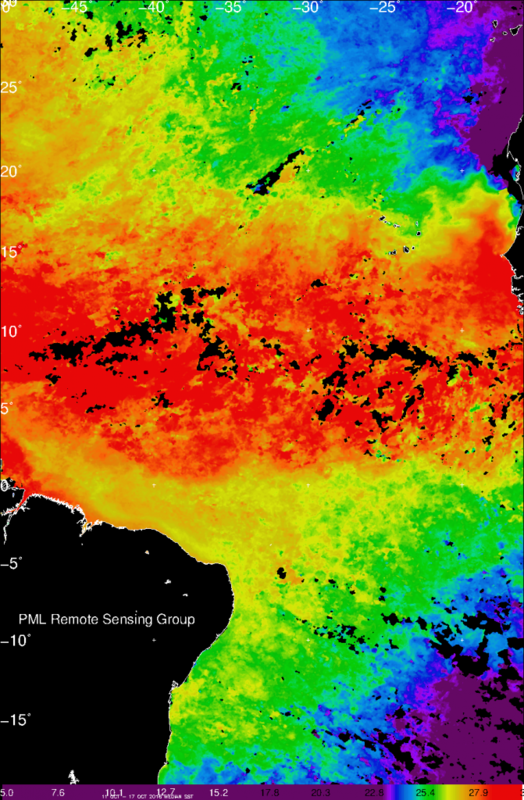 Further south, AVHRR sea-surface temperature showed warmer water (>27°C) at the tropical equatorial front between 5 & 10°N and equatorial upwelling south of 0°N indicated by the out cropping of water <25°C which were associated with two filaments of higher phytoplankton biomass (0.3 – 0.5 mg m-3 Chl-a) associated with the equatorial upwelling where higher nutrients supply the photic zone. Chlorophyll-a composite on 11–17 October 2016.